Herpes simplex keratitis (HSK) is the leading infectious cause of blindness in the United States. As the front line of eyecare, optometric physicians play an important role in treating this infection. The herpes simplex virus (HSV) is a common cause of infection. Approximately 25% of the population is seropositive for HSV at age 4. This jumps to 100% by age 60. With such prevalence, it may not be surprising that 50,000 new cases occur each year or that 400,000 Americans have had some form of ocular herpes. HSK is challenging for both optometric physicians and patients. After primary ocular infection, the herpes virus becomes latent but episodes of recurrent infection or inflammation are typical and can damage the corneal structure such that corneal transplantation is required. Even after successful transplant surgery, HSK recurrences can lead to corneal graft rejection. Oral antivirals – Acyclovir (Zovirax) has been shown to be as effective as Viroptic. Zirgan (topical ganciclovir gel) – Received FDA approval in 2009 as a safe and effective treatment option. Oral acyclovir was also found to reduce the incidence of epithelial herpetic keratitis from developing into stromal disease or keratitis. No added benefit was found by adding oral acyclovir if the patient was already taking Viroptic. Some clinicians have adopted an orals only approach to treating HSK—including recurrent and stromal keratitis as well as initial dendritic ulcers. There are several likely reasons, including high rates of Viroptic-associated corneal toxicity, the difficulty in keeping up with 9 doses a day, and the low cost of generic acyclovir. The dosage for newer oral antivirals—Valtrex (valaciclovir) and Famvir (famcivlovir)—is 3 times a day for 1 week, so compliance may be even better than with acyclovir. In addition, a recent study showed that patients with acute HSK placed on oral antivirals were more than 9 times less likely to experience recurrence. 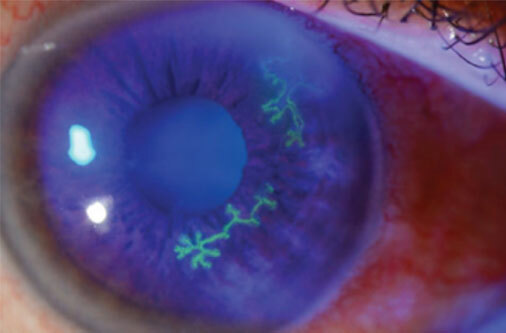 While researchers and clinicians acknowledge the benefits of oral antivirals, consensus has not been reached that oral antivirals alone should replace topical treatment for dendritic keratitis—particularly initial episodes. Zirgan is the first new topical medication to be approved for treatment of acute herpetic keratitis (dendritic ulcers) in more than 3 decades. An open-label, randomized, controlled, multicenter clinical trial involving 164 patients with herpetic keratitis found Zirgan to be as effective as acyclovir ophthalmic ointment 3%. In 3 randomized, single-masked, controlled, multicenter clinical trials involving 213 patients, Zirgan was as good as acyclovir ophthalmic ointment 3% in patients with dendritic ulcers. Adverse reactions were mild, the most common being blurred vision (60%), irritation (20%), punctate keratitis (5%), and conjunctival hyperemia (5%). The recommended dosing regimen for Zirgan is 1 drop in the affected eye 5 times per day, approximately every 3 hours while awake until the corneal ulcer heals, and then 1 drop 3 times per day for 7 days. Patients should not wear contact lenses if they have signs or symptoms of herpetic keratitis or during the course of therapy with Zirgan. Zirgan’s advantages, combined with Viroptic’s decreased availability, have led to Zirgan becoming many practitioners’ drug of choice for HSV keratitis. 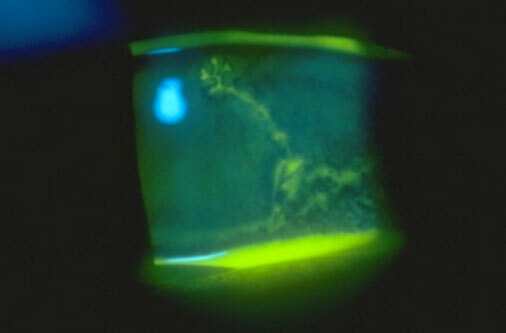 However, even with new treatment strategies, herpetic keratitis can have a prolonged clinical course. And the tendency to cause corneal scarring requires close attention. Referral for specialty care should be considered when the infection is anticipated to cause loss of acuity, or when no improvement has been seen after several days of treatment. Your close observation and understanding of new treatment strategies will help patients deal with this challenging condition.